Not only is the dolphin vibrant leaping through the waves, but it almost seems fluorescent when it's underwater. And swimming alongside its grey-toned friend, it really stands out. This video was shot by Kate Cummings at the Monterey Bay, California. 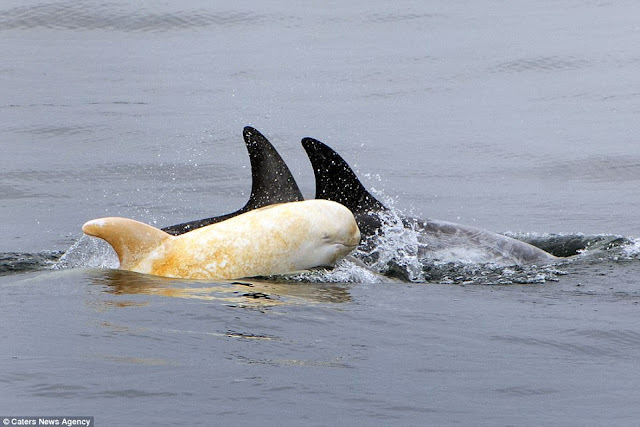 Ms Cummings said: 'Albinos animals in the wild are incredibly rare, as far as we know this is the only albino Risso's dolphin in the Eastern Pacific. 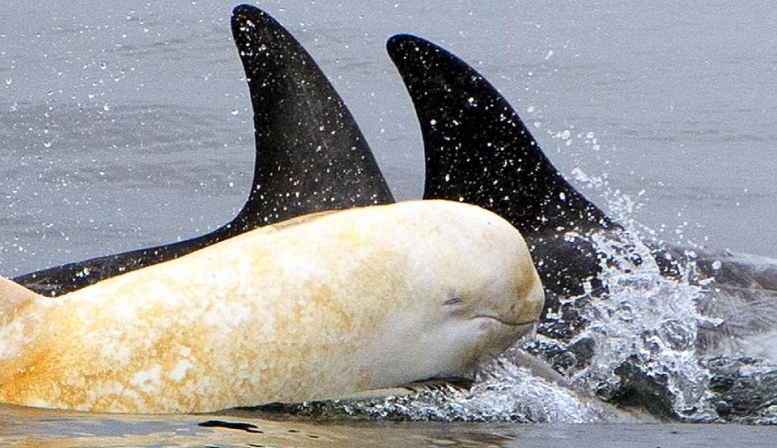 'Seeing the dolphin felt incredibly special because it's such a rare sighting. 'This breed can be identified by the unique pigment and scarring they collect – they get scars from each other's teeth. 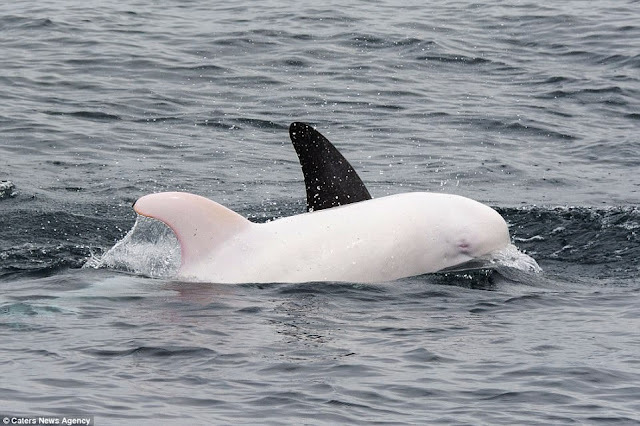 Risso's dolphins are rare but the IUCN Red List of Threatened Species considers this species 'data deficient' due to insufficient information on population status and trends. Albinism has been observed in more than 20 species of oceangoing mammals, according to the National Oceanic and Atmospheric Administration (NOAA), but appears to be rare in dolphins. Animals with the genetic trait are not believed to be inherently weaker or less capable than regular dolphins, though their colour can make them easier targets for predators. 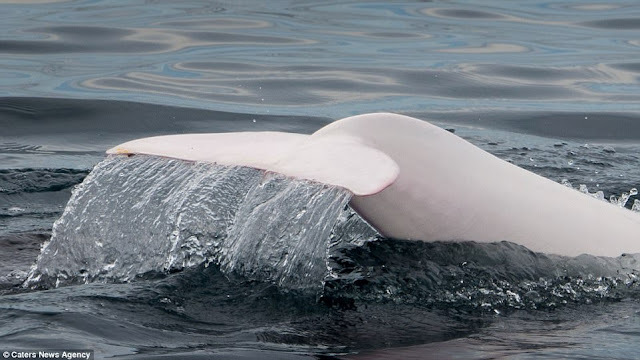 Responses to "Incredibly rare albino dolphin is filmed frolicking off the Californian coast"
Poor thing will be spotted from under and over. I wonder if the pod will let it stay with them when it gets older. It sure will attract predators. 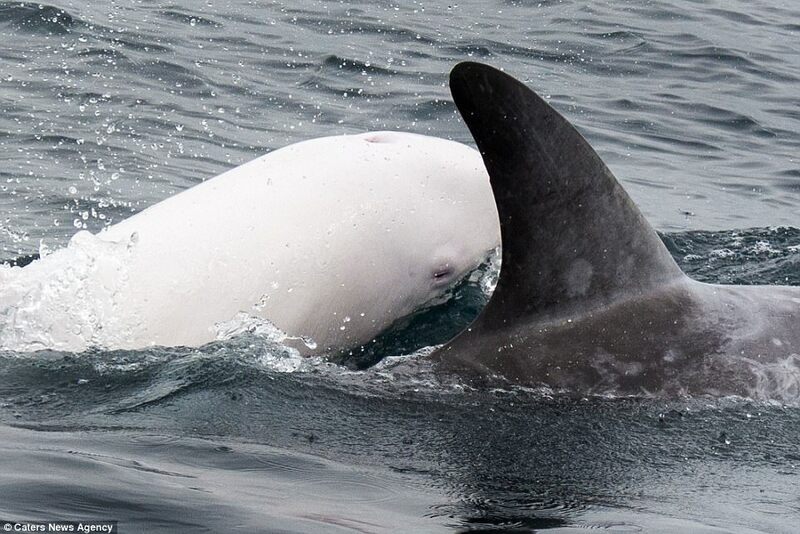 Risso's dolphins often end up almost completely white as they get older anyway, so I'm sure this albino one won't attract predators much more than an almost white adult. what a lovely beautiful rarity. if we humans will just leave it be and be content to see it in photos that would be the most beneficial. we dont have to possess to enjoy. lovely creatures, they.